Tommy Doyle puts the finishing touches on the annual shamrock painting at the intersection of Ridge and Midvale avenues early in the morning of Monday, March 6, 2017. It was the 58th time the shamrock has appeared there. It’s not as if he could’ve gotten much rest Sunday into Monday. He had a 4 a.m. appointment with his brother Mike and nephew Richie Evans to paint the annual shamrock at the intersection of Ridge and Midvale avenues, after all. 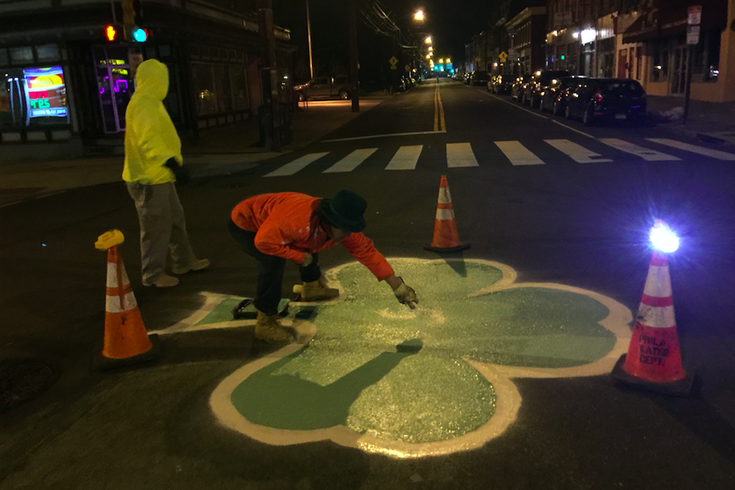 Instead of fighting to rest, he met his traffic-paint wielding cohorts around 3:45 a.m. and got to work on the 58th rendition of a neighborhood tradition that devolved into a bragging-rights beef when PhillyVoice brought you the shamrock’s backstory in 2016. Tommy already had the white outline down before they arrived in the pre-dawn early Monday morning. “I was gonna leave the number off, but if it’s the 58th year, it’s the 58th year,” said Doyle, who painted the 56th leaf just weeks after suffering a heart attack. “A lot of the feedback I got over the past year was positive, people saying (that others questioning my involvement) should just get over it. He was referring to the backlash that followed a story that some saw as Doyle taking credit for a tradition that involved many others, despite Doyle lauding those former fellow painters in quotes about the shamrock. Back in the day, there’d be a crew of dozens out at the normally busy (but barren at 4 a.m.) intersection, partying and celebrating St. Patrick’s Day more than a week early (the painting date is tied to Tommy’s son’s birthday). “It was like Mardi Gras down here,” he said. 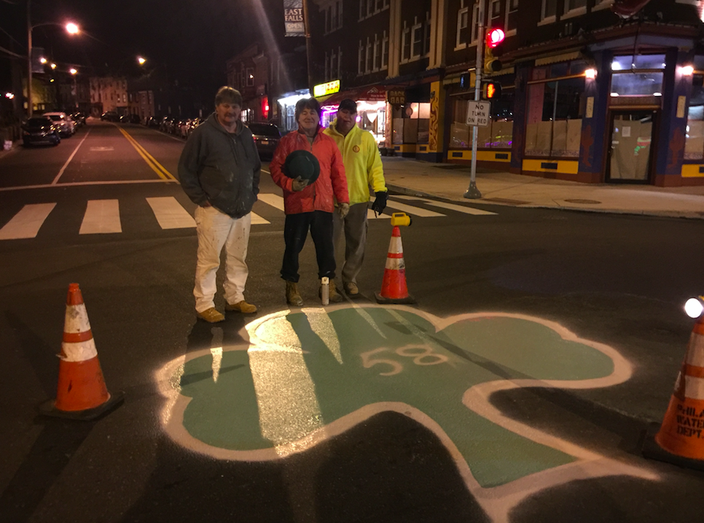 But on this day, it was just the trio, a stencil outline (which he'd never used before), three “borrowed” orange cones, a pair of flashlights and a mixed can of traffic paint that would leave the bright-green tribute on the ground for all passersby to see. Tommy Doyle (middle) was joined by his brother Mike and nephew Richie Ennis for the annual shamrock painting at Ridge and Midvale avenues in East Falls around 4 a.m. on Monday, March 6, 2017. They were done with their artistry but for putting some leftover paint in the tray onto the shamrock – which is better centered this year, for what it's worth – around 4:25 a.m.
That’s around the same time that a 39th District police officer drove by to check on their progress and safety near an empty A-Plus mini-mart and the restaurant formerly known as Johnny Manana’s, now under renovation. Doyle maintains that they learned lessons from previous years when the shamrock would fade within months if not days. To that end, the faded 57 still shows from last year’s rendition. Before the three left to catch up on much-needed sleep, there was talk about adding gold and some tint to next year’s shamrock. “It’s the biggest day of the year for me. Bigger than New Year’s. It’s more important,” Doyle said. “I always thought about painting this on a Saturday night (wee hours Sunday), but it seems like every drunk out there drives through Ridge and Midvale then, so it’s safer this way.